If you’re wondering what the best in retirement living would look like near Daytona Beach, Florida, then schedule a visit to Bear Creek in Ormond Beach. We’re just a few miles north of Daytona Beach, and offer everything a retiree desires – affordable housing, resort-style amenities, and a convenient location that allows them to take advantage of all that the region has to offer. Retirement living has never been better! Of course, it’s hardly retirement living if you just sit at home, which is why we designed our community with the active retiree in mind. Within our security gates, you’ll have unfettered access to three beautiful swimming pools, each with its own heated spa to relax sore muscles. 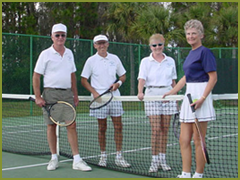 We also have courts for playing tennis, shuffleboard, and even the very popular pickleball. For those who enjoy exercise, we have a fully equipped fitness room, as well as an aerobics room. Plus, there are lots of activities scheduled to bring neighbors together for recreation and socializing. To learn more about how to experience the best in retirement living near Daytona Beach, FL, contact one of the friendly Lifestyle Consultants at Bear Creek today.